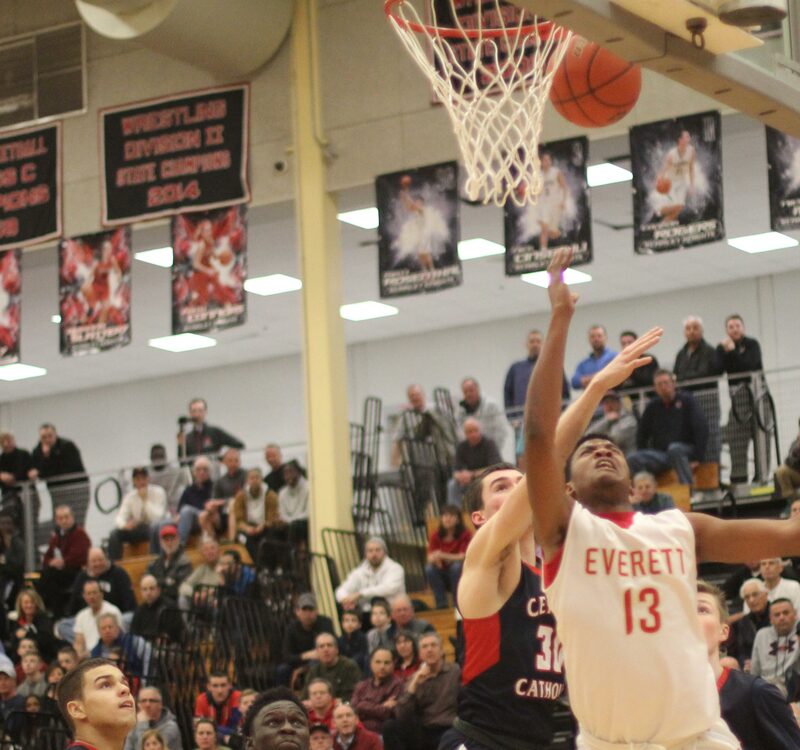 Ghared Boyce, defended by Kevin Constant, has a possible game-tying shot in the air as the buzzer sounds. 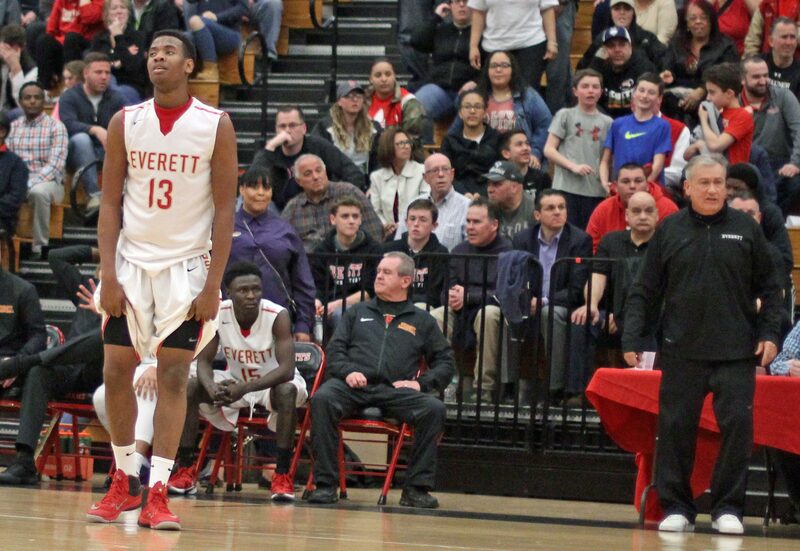 Bret Edwards found two openings to the basket late in the game. 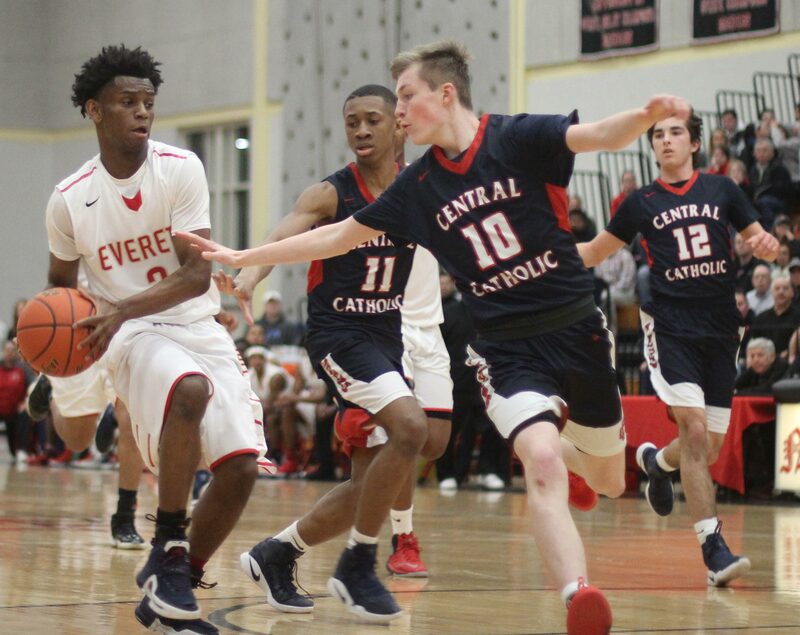 (North Andover MA) Ghared Boyce put up his second 3-pointer in the final thirty seconds but this one didn’t go and #3 Central Catholic had a gutsy 68-65 win over #2 Everett on Wednesday night. 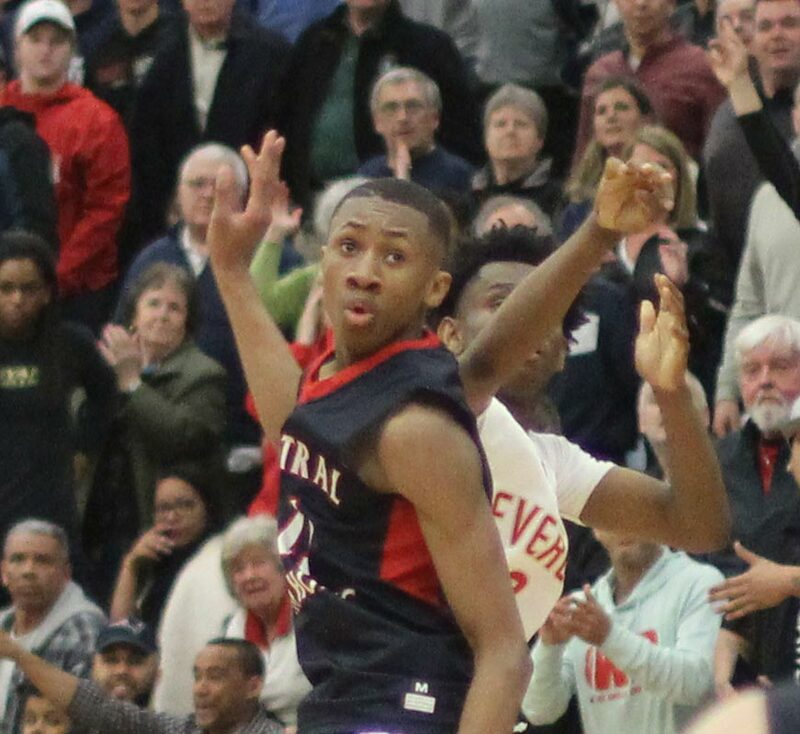 The victory sends Central (20-5) to the Division 1 North finals on Saturday against Cambridge at North Andover High School (6PM). 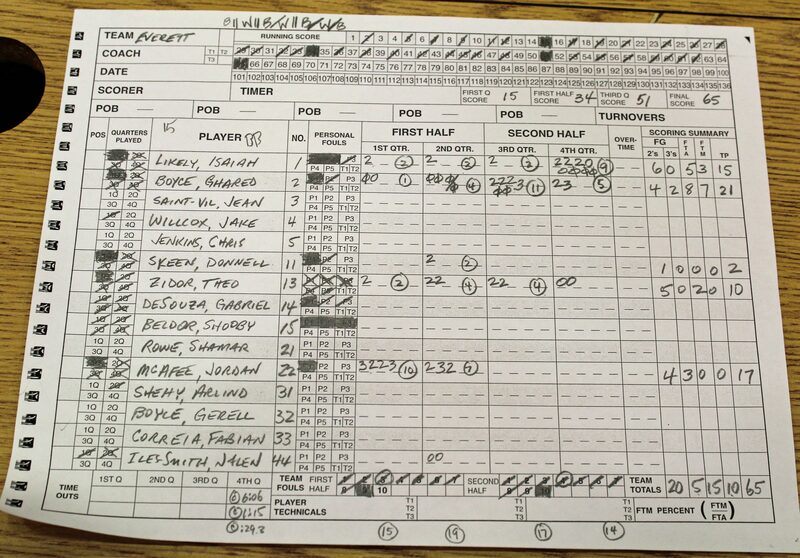 The Raiders lost, 70-61, to Cambridge in February. Tonight’s game was exciting and enthusiastically watched. Fifteen lead changes will do that to you! 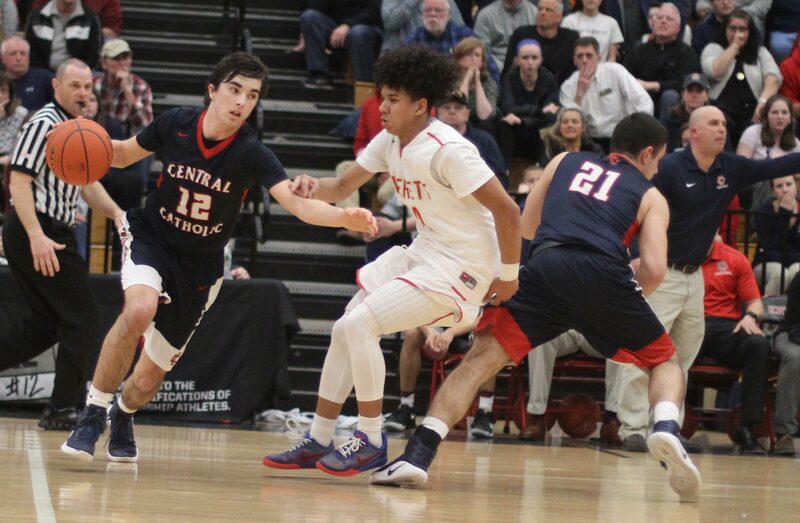 Bret Edwards turned out to be the hero for Central because he cashed two layups in the last 1:18 of the contest. 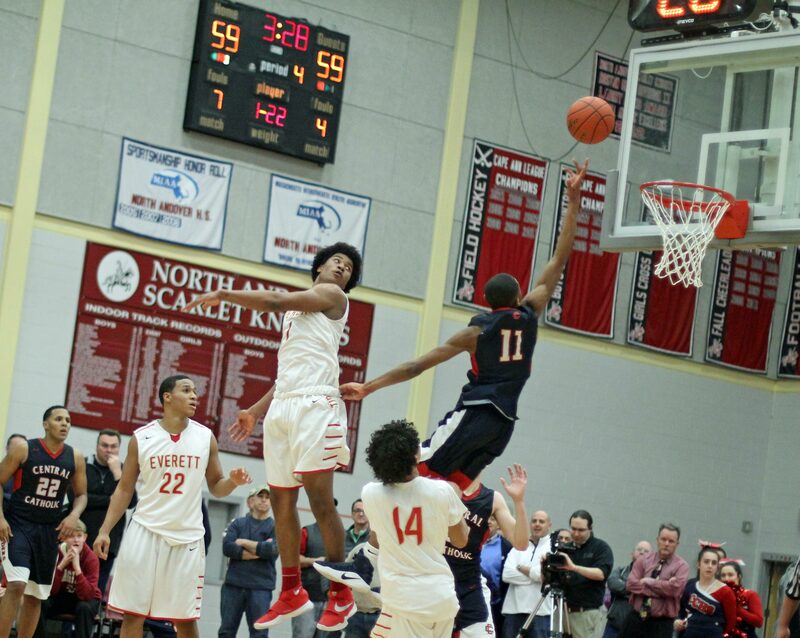 Bret’s first layup was answered by a second-chance triple by Ghared Boyce that put the Tide (19-3) within one (66-65). Bret’s second layup, with eleven seconds left, gave the Raiders a 3-point cushion. When Ghared’s last-second, triple try went wide the team from Lawrence had win #20 and at least one more game to play. Theo Zidor gets the bad news (5 fouls) with three minutes left. The reigning Super Bowl champs played much of the second half without 6’6” inside player Theo Zidor because of foul trouble. 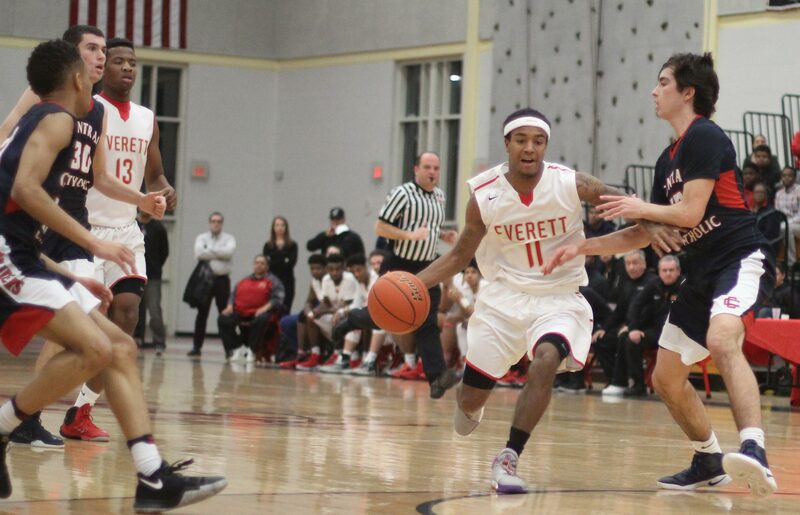 Junior Ghared Boyce led all scorers with twenty-one points. Ghared already has 1000 points. 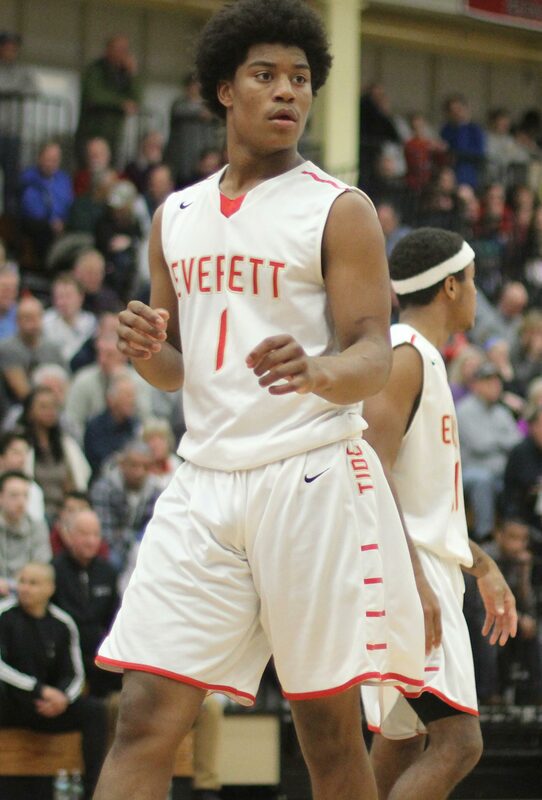 The 6’ guard had a quiet first half (five points) but was the go-to guy for Everett down the stretch. 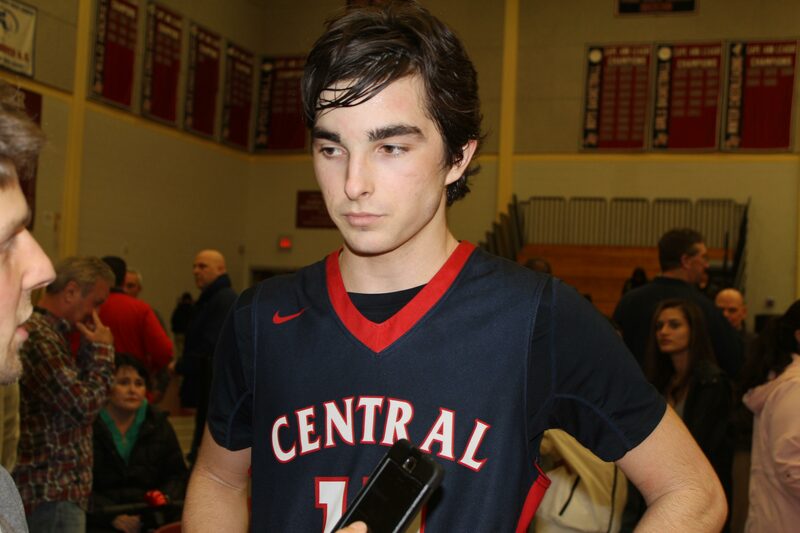 Colin Bradanese paced Central with twenty points. 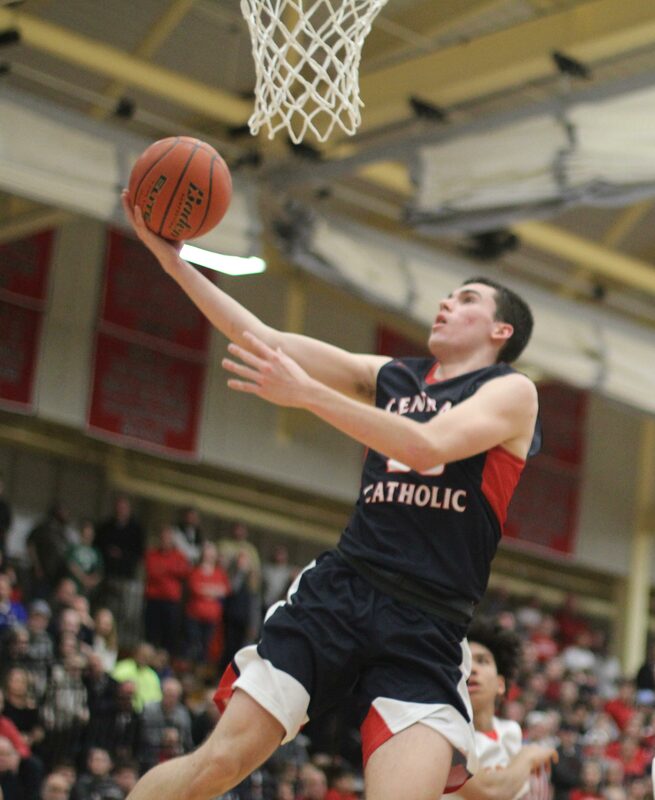 Teammate Dom Keegan drained five triples for fifteen points. CC had eight from long range. 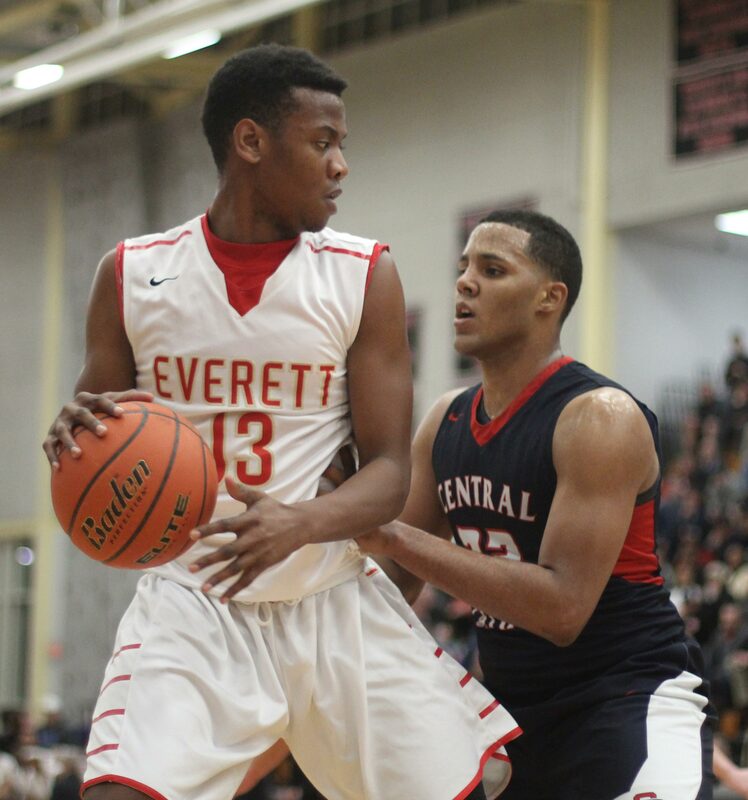 Jordan McAfee carried Everett in the first half with seventeen points. 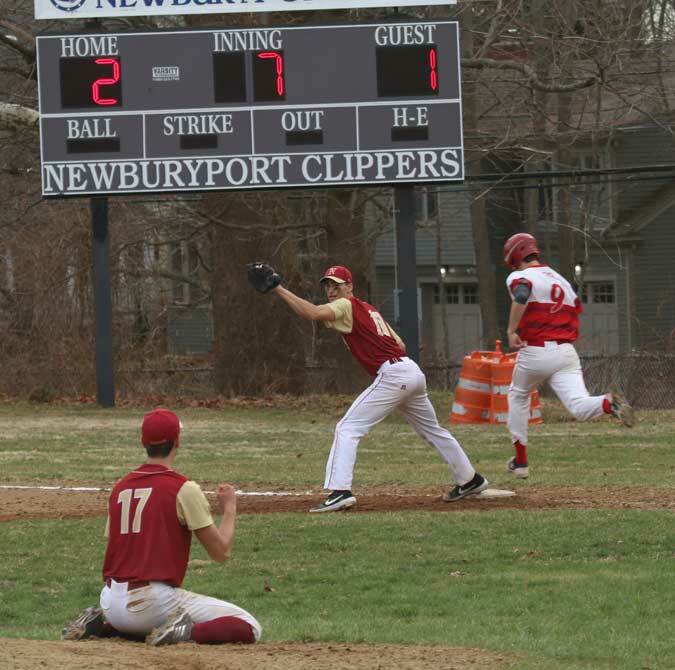 Sam Lara had a quiet six points for CC after netting twenty-five in the quarter-finals against Andover. 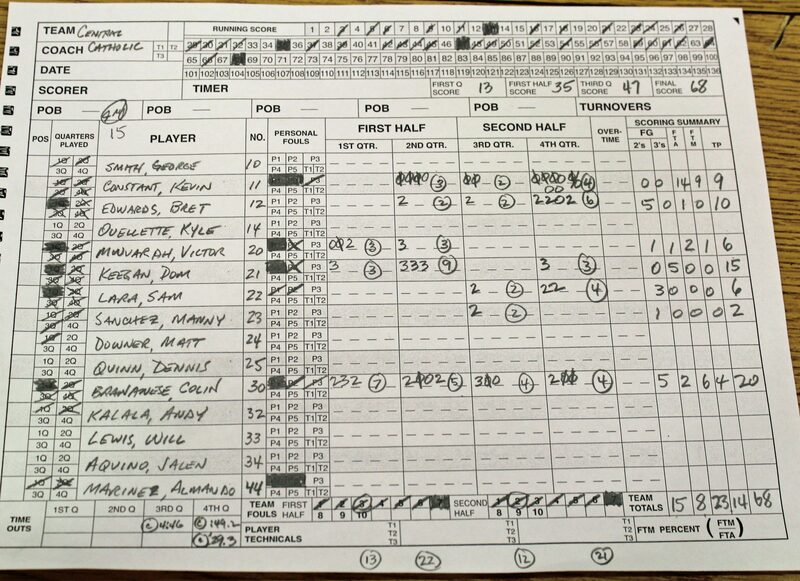 The Raiders won despite missing nine free throws (14/23). 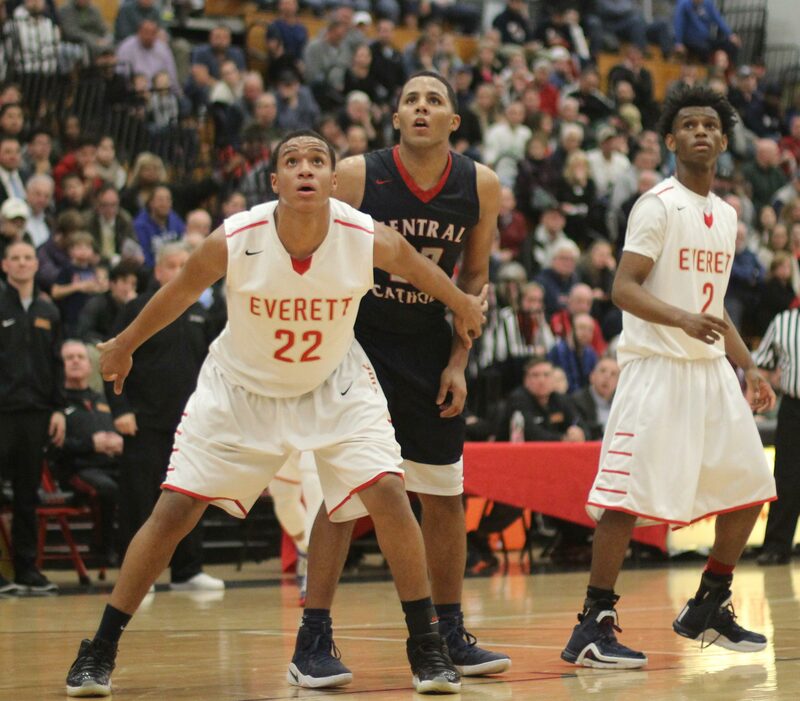 Everett has now last five straight years in the D1 North semi-finals. Ghared Boyce (21 points) sees double coverage.